This morning was Music Together out at Ocean Park. It's such a beautiful setting with the smell of the forest and ocean, but not close enough to the water for the kids to want to go to the beach every time we go. They're generally content having a bit of a wander afterwards; playing with one of their little friends, before coming home for lunch. I'll spare you the pictures of the sandwiches they refused to eat and the yogurt and blueberries that were spread all over the floor. At least I was a little productive while they were causing trouble. Ah, toddler and preschooler mom life. I made Banana Bread from thekitchn.com. The only changes I made were to add a little cinnamon and vanilla. It took 1hr10m in the oven before it was ready, which was quite a bit longer than the recipe called for. It looks like it'll be good, but it's still cooling on the counter. Am I the only one who doesn't like warm baked goods? Cold? Yes. Warm? No. The dishes are done, counters are clean, kids are napping. I'm exhausted. I have a bit of a spring sinus bug that's really dragging me down. I think I've been as productive as I'm going to be today. On a woolier note, I've been having so much fun working on this pair of watermelon stripe socks from Biscotte & Cie Bis-Sock! My brother and his girlfriend gave me this skein for my birthday, and it was such a great surprise! 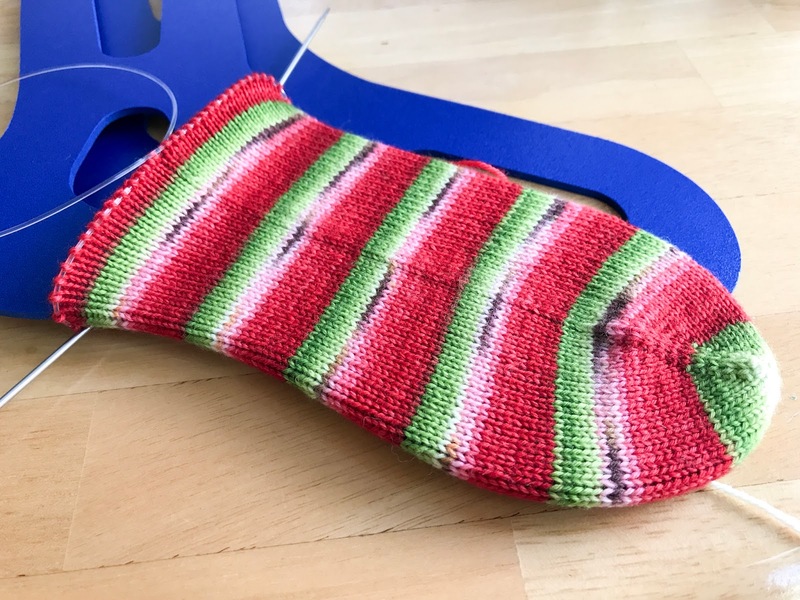 These socks are toe up, two at a time on two different Hiya Hiya circular needles (2mm), and I'm magic looping. I split the skein in half by weight so I could work on then in tandem. I'm planning to get both feet finished before inserting a fish lips kiss heel. I'm really thinking of doing 2x2 ribbing up the leg, but I haven't decided yet. I still have a few inches and some heels to go before I really have to make a decision. This yarn has such fun patterning and is soooooo incredibly soft. I've been eyeing their Blue Pansies colourway as a possible stash acquisition in the future since it has a similar patterning. I'm getting ready to cast on for another pair of handspun socks, but I'll share more details on that when I actually get around to it. Last week I finally started spinning the fiber I won last year from participating in Tour de Fleece on Team Bosworth. All the spinning I did during Tour de Fleece was on various spindles and I did pretty well with my group participation. 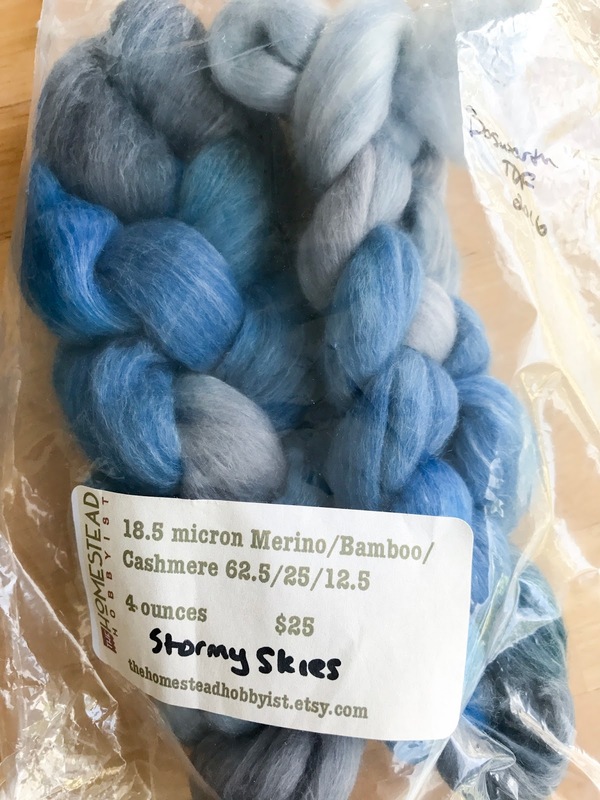 I ended up winning a braid of fiber from The Homestead Hobbyist. The fiber is merino, bamboo, cashmere, a blend I wouldn't normally spin, and honestly, probably would never have picked on my own. It's actually turned out to be quite a pleasant spin though. I'd consider spinning this blend again for sure. The fiber was really nicely prepped, but having spent nearly a year in my stash, it was a bit compressed, so I ended up splitting it vertically and predrafting it quite heavily. This will be a 2-ply yarn when it is finished, so I started out by splitting the fiber in two horizontally (one for each ply), then taking each of those strips and splitting them horizontally again (4 pieces total). I put half aside for the second ply, and started working with the remaining half. I had intended to split the combed top vertically 8 times across the full width of the fiber, but in the end I split it 16 times to make lots of thin strips. The fiber was compressed from storage and quite dense because of the bamboo content, so this made it much easier to spin. After splitting the fiber vertically, I predrafted and stated spinning on my 20 gram Large Natural Knotwood (Capar) Spindle. This spindle is super light for its size. 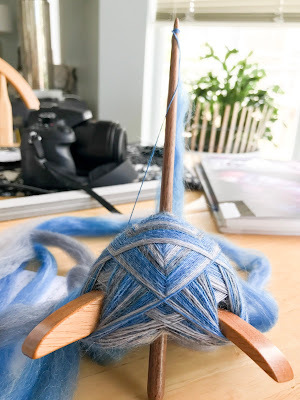 This fiber is super slick to spin, but is quite a pleasant experience on the Turkish spindle. Normally I make lots of smaller turtles to be combined during plying, but this time I really wanted to see how much fiber I could fit on the spindle and still be able to spin well. I'm nearly through the first half of this braid and the turtle is huge! The spindle is getting heavy and I don't think I could comfortably spin much more without starting a new turtle. It's taking significantly more force to get the spindle spinning and it doesn't stay spinning as long. ETA: I ended up pulling off the first turtle when it weighed 40 grams.